Captain America has no problem keeping warm, even when his superhero duties take him to the coldest places on Earth. After all, his body is at peak human condition, so he can handle it with no problem! The rest of us? Well, we have to bundle up in some warm winter wear to keep chilly weather from winning the battle. 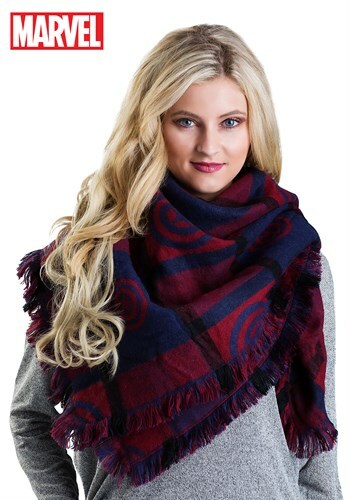 We need an extra edge when trying to stay warm and that’s exactly what this women’s Captain America blanket scarf is for. This Marvel superhero-inspired scarf is your secret weapon in the battle against the cold. The scarf is made out of an extra warm custom woven acrylic material that has Captain America shields designed right into the fabric. The extra-large design means that you can wrap it around your neck, or drape it around your arms to help keep you warm during winter’s frostiest days.